A crowd-pleasing jubilation, Uruphong Raksasad's The Songs of Rice (เพลงของข้าว, Pleng Khong Kao) is a poetic portrait of the various rituals and celebrations that accompany the cultivation of rice in Thailand. It starts off quietly and gently, with only the sounds of chirping birds and the buzz of insects, and slowly builds up until it explodes. The sounds and tempo then gradually trail off until the movie is right back where it started. As with Uruphong's previous features, Stories from the North and Agrarian Utopia, genius camerawork is the highlight. Uruphong shoots the moon and then zooms back out to focus on the head of a grasshopper. He does this a lot, showing you something pretty amazing and then turning the camera to reveal something even more astonishing. One early dramatic scene involves a Buddhist temple blessing procession, featuring worshippers in white parading along a rural road with a pair of elephants. The procession leads to a hilltop temple adorned by a golden stupa. Fans of Agrarian Utopia will recognize the place. If all that isn't enough, there's a guy riding a para-glider, flying around above it all. The Songs of Rice completes a trilogy for the director. 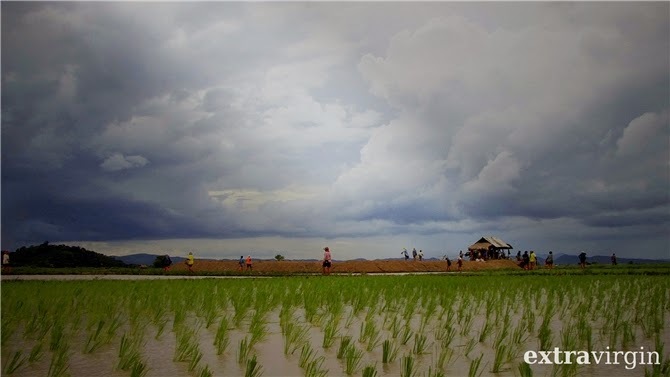 Stories from the North was a compilation of vignettes of the director's neighbors in his native rural Chiang Rai, while Agrarian Utopia followed a pair of farming families as they struggled to make ends meet while growing rice by hand on a single plot of land in Chiang Rai. That same spot in Thailand's far North is revisited in The Songs of Rice, but Uruphong casts his gaze further afield, filming up and and down the countryside. 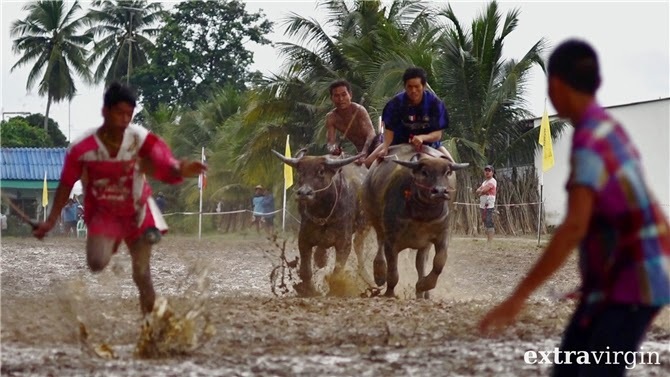 Places visited include Chon Buri on the Eastern Seaboard, for the water-buffalo races, and in Isaan, the Northeast, the bang-fai (rocket) festival in Yasothon and a visit with the travelling families and their spacecraft-like harvesting machines in Roi Et. The rocket festival, an annual rite in which homemade rockets are launched in a prayer for fertility and abundance, has been depicted before in such movies as Kim Mordaunt's The Rocket and Panna Rittikrai's Dynamite Warrior. But there's another element of the festival that's probably not as widely depicted – along with the the usual bamboo and blue-PVC-pipe projectiles, there is also the spinning discs that spiral into the sky. These fertilizer-fueled Frisbees are huge – one is hauled in on a 10-wheel truck and placed on the launchpad with a crane. The men use long burning sticks to set off the fuse, made of old monk's robes, and then run and jump for cover behind a mound of dirt. When the rockets work, it's pretty dramatic and beautiful, but when they don't work, it's also pretty dramatic and beautiful. And is if exploding rockets aren't enough, there's music and dance performances to further liven things up. Cross-dressing men, likely inebriated, bang drums and play traditional instruments. A beautiful transgender person prepares a spicy somtum-and-sticky-rice feast – watch for the symbolism of the mortar and pestle. Steaming sticky sweet dessert is ritually prepared – mounds of it. A granny hula hoops, teetering on the edge of a rice paddy. A rotund dancer waggles her behind to the delight of a provincial governor and other dignataries. A beauty queen rides in a golden cart pulled by water buffalo. It's a rig that the gods could use to fly across the sky. Communities, young and old, pull together to celebrate. In this time of troubled politics polarizing Thai society, The Songs of Rice is a healing message. It gets back to the basics of stuff that really matters – traditions, culture, spirituality, food and just plain living. Capping off the closing day of the Salaya International Documentary Film Festival, The Songs of Rice, along with Soundtrack for a Revolution and Cambodian director Rithy Panh's The Missing Picture, left me to ponder what really matters. The right to be treated like a human being. Honoring the haunting memories of family members who died at the hands of a genocidal regime. The act of growing the food that sustains us. These are basic things I think Thailand's warring political parties have lost sight of in their fight to protect their own comparatively petty, selfish interests. There's nothing really political about The Songs of Rice, but with politics tearing apart the country right now, it's hard for me to come to any other conclusion than I just have.